Another snub fighter known for its ability to be upgraded and ease of conversion, the Cloakshape fighter traces its origins back to decades before the Clone Wars. Considered by many to be the most easily convertible fighter ever made, knowledgeable mechanics argue that there is no such thing as a �standard� Cloakshape. In the Clone Wars era it was used in many planetary defense forces, though like the Z-95 over the decades it found its way into the hands of numerous factions, on all sides of the law. 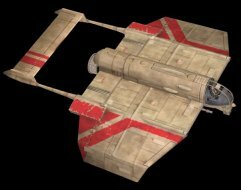 The SCS as represented is a combat oriented Cloakshape from the start of the Clone Wars. A Hyperdrive Ring conversion kit is also available.